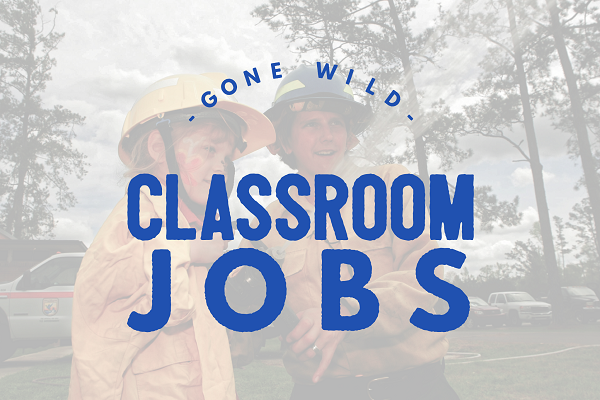 Gone Wild: Classroom Jobs | So You Want To Teach? Hello, Readers. I decided to take Joel up on his offer of EduBloggers Gone Wild. My name is Miss A and you can find me at Confessions From the Couch. I am beginning my 4th year of teaching in an urban school district and no longer under new teacher status. I feel like I’m at a place where I must CONTRIBUTE to the edublogging community. As I enter into the this new phase of my career, I am using blogging as a reflective and personal growth tool-with limited complaining and griping-because I love my job and the impact it has on my life. My goal is to share my ideas as well as solicit the ideas of other teachers out there. I really didn’t know what to write here, so, I decided to repost something that I just posted on my own blog. Background: In my first years of teaching I dealt with classroom management problems more than teaching. What I realized in my 3rd year was the division of labor in my classroom was off balance-me doing everything = chaos. I know that students want to help. So, I plan give them the opportunity help my classroom community as well as take responsibility for what happens there. At the beginning of the year, I will offer the job up to volunteers. If there is more than one person who wants a particular job, I will draw from a hat. In the future, I think we will take volunteers and have elections for high demand positions. So if a student does not want to have a job, they don’t ever have to. A large part of what I did was based on Mrs. Newinghams Classroom Economy. When you see her site you will fall in LOVE with her work. So here are my TENTATIVE classroom jobs and their job descriptions. This person will make sure the classroom is clean and orderly at the end of class. They will take up trash at the end of class and ask students to clean up behind themselves. The goal is make sure the class is clean and ready for the next class. The Sanitation Commissioner may end up being the last person out of class at the end of the period. The person will complete the assignment book on a daily basis. This person will be in charge of making sure our environment is set for whatever we are doing for that day. The will hit the lights, openwindows, odor control, etc. This person will make class announcements. (I thought this was a fun position.) I will have the announcements written, but this person will verbalize them, so I don’t have to keep repeating myself everyday, every hour. This person will keep time during class. They will let me know when my 12 minutes of lecture time are up and when there is 7 minutes left in class to go through the wrap up. The time keeper will keep time of task as a direct. This person will come after school and help me with the blog, updating it with information from the secretary log. Responsible for making sure that the classroom library is orderly at the end of class and books are stack the way I like them. One student from each class will come after school to clean off the boards, wipe down desks, dust, close windows and help prepare the room for the next day. READ But I Don't Have Time To Subscribe To Your Blog! Are the any jobs that I’ve left out that would help a classroom run more smoothly? 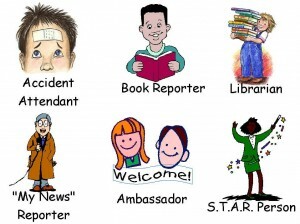 What some jobs that you have in your class? What could I do better? Let’s discuss. I always have a hard time coming up with ideas for jobs, so thanks for this! I love your job descriptions and I would love to steal them, I mean borrow them, if that is okay with you. However, I don’t give any class money or currency, just some good, old-fashion Mama Monkey Love. I teach the kids that being part of our community is doing things to help others just for the pure joy of helping others. I guess I’m just too lazy to keep track of all of the cashflow and I’ve probably read one too many Alfie Kohn books on intrinsic motivation. But if it works for you, then knock yourself out sister! I am firm believer in doing what works for you and don’t worry about what anyone else does. Awesome idea! How often do you change jobs? What about the students that start a job but want to switch part way through? As a second year teacher, I am planning on giving students jobs this year (I ran myself ragged last year!! ), but I wasn’t sure how to go about it. Thanks for your ideas. I will use many of them and modify others. The kids really do want to help and this will put them to work, as well as give me time to TEACH! Enjoy your year. Awesome ideas here. For the last two years, I have had a student in each class who takes attendance for me. After she is finished, I’ll double check it, but it saves a ton of time for sure. I wanted thank everyone for their kind comments and encouragement as I try something new in my classroom this year. It is a pleasure to help others organize their classroom, too. So, take and use as you want. I will be cleaning this document up and formatting into a �handout� that can be passed out to students, so that they can think about what jobs they want to do. I know a lot of people don�t believe in motivating students with extra credit. At my school, the principal emphasizes giving our students �extra work opportunities.� I think that contributing to the classroom is a social studies skill�enhancing and promoting citizenship skills. I really do believe that students should be intrinsically motivated to work in the classroom, but I am considering it an �extra� work opportunity. I would add it to their participation grade, but I don�t have enough jobs for every student in the class�that is why I have it laid out the way I do. The 6 points can really make a difference at the end of a term. A math teacher did a calculation and 6 points is what she came up with as being fair & could take a student from one letter grade to the next, without giving them too much. She�s been doing it for 20 yrs and it works, so I think it will work for me. I plan for students to switch jobs every term; no one will be able to hold the same job more than 1 term. Those who have not had a job will have first priority and pick of jobs�volunteers first. Tamara, I agree that the Sanitation Commissioner is worth more points. However, they don�t have to pick up the trash themselves. They should get the students to do it and pass around a bucket, so students could place their trash in. David, I know you have your style and it works for you, but I got exhausted and felt like I was dealing with too many interruptions and sometimes classroom management junk would take up a good portion of the class . . . so this my way of handling. Thanks, again for going and participating in this discussion. @K – I teach middle school and have had great success with letting the kids begin taking over some of the mundane tasks. I am a huge proponent of letting them grade their own papers, as well as giving them extra work to help out. Kids love acting like adults. If you sell it to them in that sense, even at the middle school or high school levels, they will buy it and be on board. As with any new concept, you need to stick to your guns and give it some time to develop. Ignore the criticisms and do what you know is right. In the end, the plan will prevail. I will avoid discussing the blatantly obvious similarities to President Bush’s course of actions overseas, the media’s whiny complaints, and the successes we are beginning to see despite their criticisms. I teach high school World History–consist mostly of 9th grade with some 10th graders spliced in. . .I also have one class of African American history for 10-12. I do a lot of “babyish” activities and they like it. And they know its just how I do things. In my freshman classes they fight over who can pass out supplies and papers. They WANT to do it. So, I have not doubt, they will want to do the rest of the jobs. I love this. I think you’re so smart to give students ownership in the classroom. Well done! I have my students apply for jobs after two weeks of school. I do a mini-lesson on applying for jobs – how to idenify what skills are needed and to promote yourself for them. They are then hired and can be fired. I teach high school and its a great way to invest students that what they are doing matter now and in the long-term.